When Heidi Horten, the widow of department store owner Helmut Horten, heard about Limitless she was apparently furious with Jon Bannenberg for creating a copy of ‘her yacht’. Clearly she needed to build something larger and finer. Returning to Lürssen, the Bremen shipyard that had built Carinthia VI for her late husband, she was permitted to peep at Tim Heywood’s preliminary drawing of the yacht that was to become Pelorus. Heywood had previously worked at the Bannenberg studio and been fully involved in the design of_ Limitless_, but the sketch of iconic superyacht Pelorus showed a quite different style, with a bold, raised forebody and a sheerline that sweeps downwards towards the stern in what is termed ‘reverse sheer’. Mrs Horten decided to follow this style and ordered a new yacht to be designed by Heywood and built by Lürssen. Crucially, its overall length had to be 98 metres – 2 metres longer than the hated Limitless. 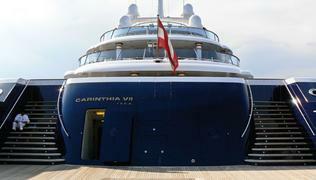 In the event, her order was quicker in build, so the new yacht, which she christened Carinthia VII, was launched in 2002, a year before the inspirational Pelorus. Heywood used some clever visual tricks to achieve the incredibly powerful profile of Carinthia VII, the most obvious being that, viewed from a distance, the main deck appears to have no windows. In fact, with darkened glass and black frames, they are set back into what at first appears to be a continuous hull side and only becomes obvious close to. The deep blue hull colour, which the makers, Awlgrip, now market as ‘Carinthia Blue’, helps to create this trompe l’oeil effect. Aiming for a profile that was as clean and uncluttered as possible, Heywood replaced the usual stanchions and handrails with glass bulwarks set in slim steel frames that do not catch the eye. Some necessary technical features such as the bridge wings and air intakes became smoothly moulded bulges in the superstructure and assumed an almost feminine character. Echoes of the earlier Carinthia remain, including the forward lean of the transom matching the outline of the stem. Another Bannenberg touch is the style line along the after part of the topsides at main deck level, formed by a large radius moulding. Forward-facing windows in the superstructure are shaded by the characteristic brow that looks like the peak of a cap. Heywood’s design extended to the layout of the interior but not the décor, which is the work of several designers and Heidi Horten herself. 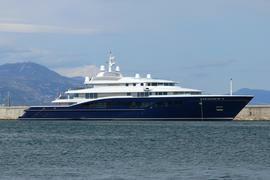 As on her previous yacht, it is private and photographs have never been published. Speed was clearly going to be an issue, and with four of the largest MTU diesels available, coupled through combining gearboxes to twin screws, a maximum of around 25 knots is possible. Whether or not she is faster than Limitless could only be decided by a race, which is never going to happen while both yachts remain with their original owners.